We have had a new room built in the grounds for use as training/meeting room. We've named it Jade room, because of its attractive exterior colour. The building is self-contained away from the main school building. It has a large carpeted room with a foldable room divider. Consequently it can be used either as one room, or as two separate areas. Each smaller area can accommodate at least 25 people for meetings, when fully open the room can accomodate approx 50 people and can offer flexible arrangements for tables and chairs. There are toilet facilities and a kitchen with fridge & dishwasher. We are able to provide refreshments as required. 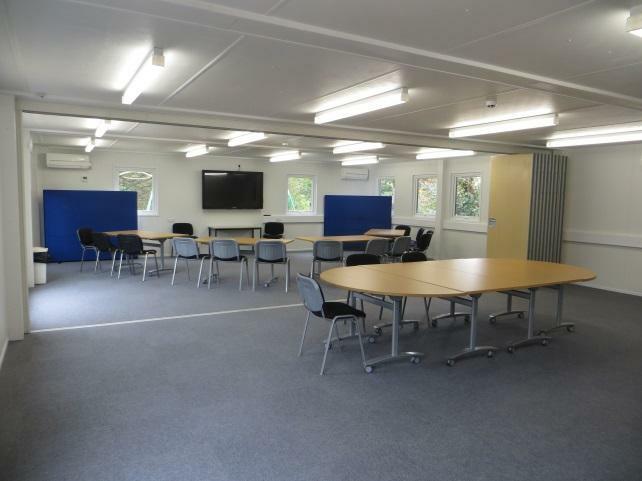 We will be using the facility for school training events, but it is also available for hire.